Mario and Donkey Kong: Minis on the Move (known as Mario & Donkey Kong: Mini Mini Carnival in Japan) is a Nintendo 3DS eShop title. It is the fifth installment of the Mario vs. Donkey Kong series, and the first made specifically for the Nintendo 3DS console. After a huge success with Super Mini Mario World in Mario vs. Donkey Kong: Mini-Land Mayhem!, the Mario Toy Company decides to host an annual Mini Toy Carnival. Donkey Kong joins Pauline to run a game arcade inside the carnival. A Mini Mario traveling through a level in Mario's Main Event. 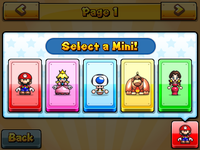 The basic objective of Mario and Donkey Kong: Minis on the Move is the same as the previous three games, in that the player must guide the Mini Marios to the goal within the time limit. In this game, however, the path is cut off in sections, and the player must either drag tiles into place or rearrange them (depending on the world) in order to create a path leading to the goal; filing in the path to the goal causes the mini to automatically speed to the goal; at this point, the timer automatically stops and the player cannot place any more tiles. Additionally, tapping one of the mini icon on the touch screen causes it to have a short burst of speed. If at any point the mini falls off the pathway or is blocked, the player fails. This also occurs if they do not move the mini out of the pipe before a certain amount of time passes, or if the player runs out of time during a stage. The player can use the and buttons at any time to change the camera angle on a course. In Mario's Main Event and Giant Jungle, the player gets pieces of pathway by tapping the "tile pipe," which causes a piece to fall in that the player can place on the path. The tile pipe can only hold five tiles at one time, and not clearing one before another enters results in failing. Occasionally, the player may also be given a bomb tile, which removes a tile that has been placed. In some courses, there are also "trash cans," in which the player can place any unneeded tiles; filling them up gives the player a "magic tile" as their next tile, which takes the form of a tile required to fill the path. In Many Mini Mayhem, the player rearrange the given path to guide multiple minis to the goal, and in Puzzle Palace the player must use the tiles given in order to create a path to the goal. Within each level in every world minus Giant Jungle are three M-Tokens; collecting all of them within a level and beating it earns the player a star, which allows them to unlock things such as extra worlds and Minis to view. The Main Game mode features four worlds total, each unlocked after collecting a certain number of stars. 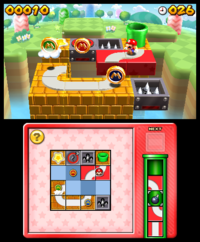 Mario's Main Event and Puzzle Palace have 60 stages. There are also 10 additional expert levels in the first two worlds that can be unlocked by clearing all of their initial stages each. Puzzle Palace has another 10 expert levels that are unlocked by clearing the world's first set of expert levels  Many Mini Mayhem contains 50 stages and Giant Jungle contains three. This makes for a total of 203 stages. Mario's Main Event - "Use the falling tiles to get the Mini to the goal!" Mini Target Smash: A minigame where the player flings Mini Marios into multiple targets. Fly Guy Grab: A minigame where the player fires a claw at Fly Guys and reels them in to earn points. Cube Crash: A minigame where the player flings Mini Marios into cubes to get points. Elevation Station: A minigame where the player must use the touch screen to position a Mini Mario into the paths of coins. There is a large variety of elements in the game, mainly appearing in Mario's Main Event. Here's a list of them. Start Tile The tile where the Mini(s) starts off. If a Mini returns there, it will simply change direction. Finish Tile Once a Mini gets there, the level is completed. As the player earns stars, new Minis will be added to the Toy Collection. In this mode, the player can view and polish his/her toys. There are a total of 12 toys that can be unlocked. Nintendo 3DS Lucas M. Thomas, IGN 7/10 "The default game mode of Mario and Donkey Kong: Minis on the Move is little more than a Nintendo-themed reskin of the 25-year-old Pipe Mania, and frustrates with its randomness. The much better Puzzle Palace and Many Mini Mayhem modes, thankfully, leave us with a good game overall. Use of more appropriate characters, better handling of the random tile dispenser, and a more robust Create & Share mode might've made this one something truly memorable." Nintendo 3DS Dan Whitehead, Eurogamer 8/10 "Minis on the Move is a thoughtfully constructed puzzle game, built around an appealingly simple premise that then gets reexamined and evolved in multiple ingenious ways. More than that, it shows Nintendo adapting to changes in the online and mobile market that suggest the best is yet to come." Nintendo 3DS Tony Ponce, Destructoid 9/10 "A part of me misses the classic arcade action that seemed poised to make a comeback at the start of the Mario vs. Donkey Kong series, but I'm still glad Nintendo decided to explore new avenues for the Minis. Mario and Donkey Kong: Minis on the Move retains some of the Lemming-like quality of the more recent MvsDK titles, but the drastic changes to the gameplay have resulted in a faster, more free-form experience. It can be as simple or as mind-bending as you want it to be; either way, you'll be satisfied for many hours on end." For this subject's image gallery, see Gallery:Mario and Donkey Kong: Minis on the Move. This page was last edited on April 7, 2019, at 02:08.